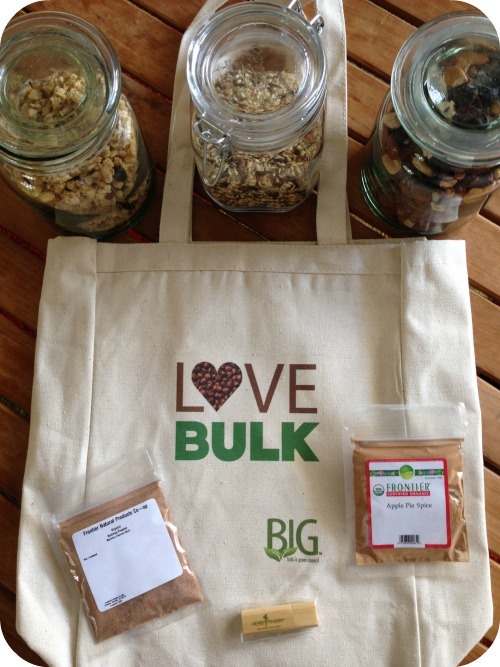 Pledge to Love Bulk Foods and Win! Earth Month is just around the corner and I have a great way for you to make a small change. Go Bulk at your favorite Health Food Grocery Stores! I love the Bulk aisle at Whole Foods. I walk up and down admiring all the fabulous healthy options and think to myself, now this is a great idea. Flour, rice, dried fruits, nuts, even chocolates and snack food. Not only is it cheaper this way, but more eco-friendly without all the packaging. To help celebrate Earth Month, The Bulk is Green Council (BIG) is challenging consumers to take the pledge to Love Bulk Foods for a chance to win a variety of products to help fill your natural and organic pantry. Pledging is easy. Sign this digital pledge at LoveBulkFoods.com and once a week during Earth Month a winner will be drawn. Do you want to see what you’ll win? 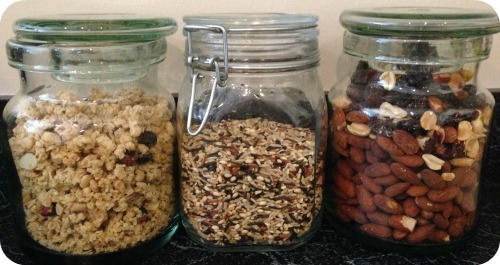 I love the idea of storing your bulk in glass jars. I recently started doing this with my organic cane sugar and plan on adding more as you can see. The trail mix and granola jars I leave out on my countertop because it is easy to grab when the kids and I need a quick fix which is often! My goal is to start buying more spices in bulk once I buy some smaller jars…I think that would be a great addition to my pantry! If Americans purchased all of their coffee from the bulk bins for 1 month (Earth Month), 20,000,000 pounds of foil packaging would be saved from landfills. That’s the equivalent weight of 7,667 compact cars. If Americans purchased all of their almonds in bulk for 1 month, 6,000,000 pounds of waste would be saved from landfills. That’s the equivalent weight of 522.5 elephants. Do you buy Bulk? If not, you need to pledge today at LoveBulkFoods.com to get you started! I partnered with the Bulk is Green Council for this post. All opinions are my own. 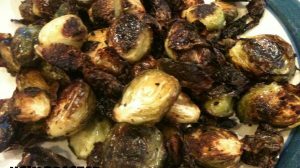 Ugly Roasted Brussels Sprouts Recipe That Kids WILL Eat! I think the glass jars filled with bulk items look so pretty too! I keep meaning to do this but I never end up at a bulk store when I need stuff! ahh. I hate all the boxes and bags I throw away every week - such a waste. I'm signing up!